Recreate your favorite restaurant-style chicken right in your kitchen. 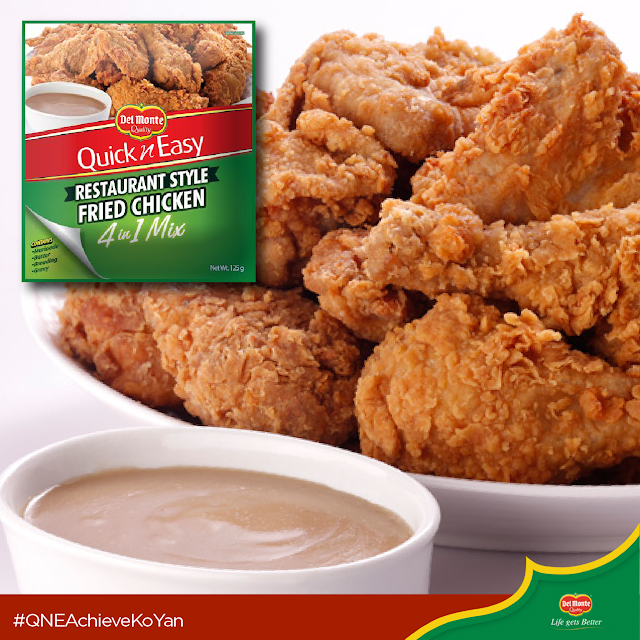 It’s easy with Del Monte Quick ’n Easy Restaurant Style Fried Chicken 4 in 1 Mix. Just follow these easy steps. 1. Marinade: Empty contents of marinade pouch in a bowl. Add 1/3 cup (80 mL) water. Mix well until free from lumps. Add chicken parts. Cover and marinate for 1 hour in the refrigerator, turning chicken pcs 2-3 times. 2. Batter: Empty contents of batter pouch in a bowl. Add ¼ cup (60 mL) water. Mix well until free from lumps. Set aside. 3.Breading: Empty contents of breading pouch on a tray or plate. Set aside. 5. Deep-fry chicken over medium heat for 12-14 minutes or until cooked or golden brown. Meanwhile, cook the gravy. 6. Gravy: Empty contents of gravy pouch in a pan. Add 1 cup (240 mL) water. Mix well until free from lumps. Bring to a boil, then lower flame. Simmer uncovered, stirring continuously for 3 minutes. 7. Serve with fried chicken. can i marinade the chicken overnight?